MANILA, Philippines – The children of former President Ferdinand Marcos have issued official statements, celebrating the decision of the Supreme Court to allow a hero’s burial for their father. Outside the High Court on Tuesday, November 8, surrounded by loyalists, Ilocos Norte Governor Imee Marcos said she was delighted with the news. “It’s a state burial and we’re delighted. It’s been 27 years na. Napakahaba na ng panahon. Sa wakas, [naisakatuparan] na ang karapatan ng tatay ko na mailibing,” she said. Her younger brother, former Senator Ferdinand Marcos Jr thanked the SC for its decision and hoped it would lead to national “healing” as well. 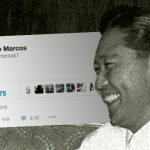 Outside the spotlight, but through public posts on social media, the younger heirs of Marcos had their own way of welcoming the news. Matthew Manotoc, Imee Marcos’ son, posted a Facebook status thanking the family’s supporters and President Rodrigo Duterte. 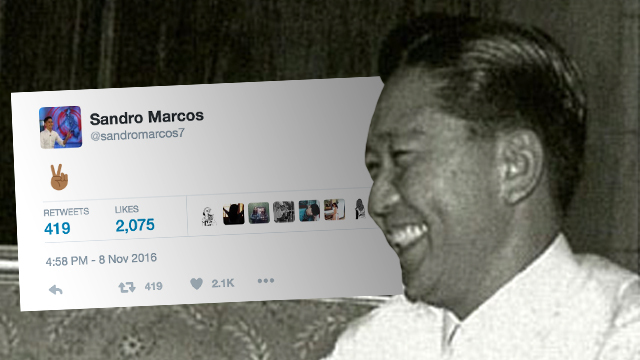 Sandro Marcos, Ferdinand Jr’s son, tweeted a peace sign emoji. On Tuesday, the Supreme Court voted 9-5 to allow the dictator’s burial at the Libingan ng mga Bayani (Heroes’ Cemetery). Malacañang hoped the decision would allow Filipinos to “move forward,” but the online world thought otherwise. A series of rallies were staged in several cities across the country to protest the decision.